When Omri’s big brother has no birthday present for him, he gives Omri an old wooden medicine cabinet he’s found. The cabinet doesn’t seem like much of a present to nine-year-old Omri, until he deposits inside it another present he receives for his birthday: a miniature plastic Indian. His mother comes up with a key for the cabinet, and the real magic begins. When Omri turns the key once, the Indian, named Little Bear, comes alive; but turn the key a second time and it’s an ordinary plastic Indian again. A Classic Book Perfect for Reluctant Readers. 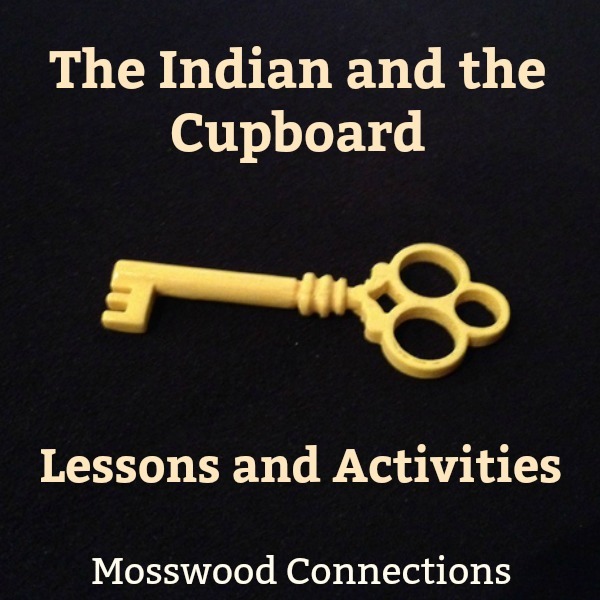 It was easy to come up with a wealth of The Indian in the Cupboard by Lynne Reid Banks Lesson and Activities. The book is rich with concepts and topics to discuss from magic to history to friendship and this book will enthrall even the most reluctant reader. I have had so much fun reading this book with my students and extending the excitement with book extension activities. 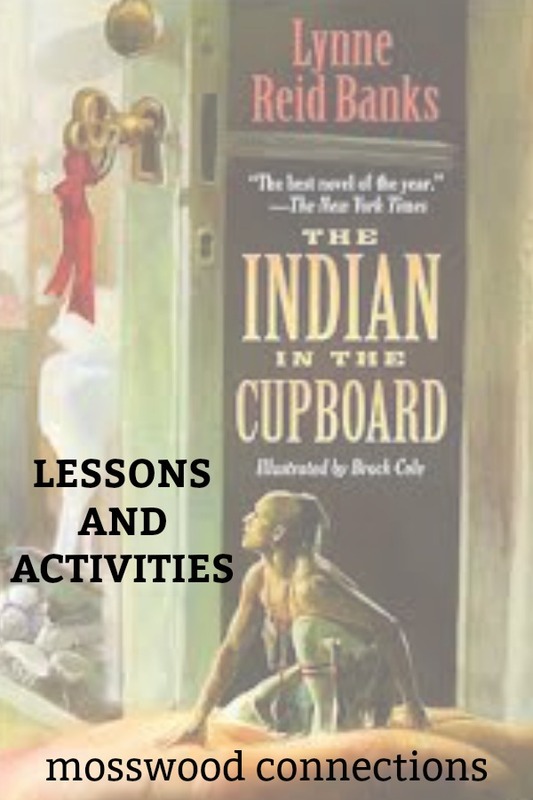 You can find the standards and discussion questions in our Indian and the Cupboard Curriculum.  If you had a magical cupboard that could bring anything to life, what object or toy would you choose?  Write a story about Little Bear and Boone, back in their own time.  Write a story about what will happen with Little Bear at school.  Should Omri tell someone about Little Bear? Why or why not?  Your assignment is to write a persuasive letter to Omri that will convince him to tell or not tell about Little Bear.  Write a letter from Little Bear to Omri. What would he say?  Write a story about where the soldier has come from and what he is like.  Write an alternate ending for the story.  Compare and contrast the characters Little Bear and Boone or Omri and Patrick. were they called “The Five Nations”? 1. Written report with references cited. 2. Oral presentation using note cards with facts. The kids can make their own longhouse. This is a good project to do as a group. There were many different native tribes in America. Help the students understand the geography of the Iroquois land and it’s relationship to our history. What was the Iroquois Confederacy? Individual Project: What’s in Your Cupboard? robot, etc.) Then have the kids come up with three hints about what they chose to put in their cupboard. Encourage the kids to keep their project secret so others can make guesses later. Wilcox and Griswold Mystery: The Case of the Missing Carrot Cake By Robin Newman & Illustrated by Deborah Zemke. Children will quickly be drawn into the mystery as they are challenged to help find the missing carrot cake. Social Skills Lessons From How to Be Human a Diary of an Autistic Girl: In the book How to Be Human: Diary of an Autistic Girl , the social-emotional activities were presented as steps to be taken to build an understanding of Theory of Mind and social-emotional control. Barbed Wire Baseball by Marissa Moss: This true story, set in a Japanese internment camp during World War II, introduces children to a little-discussed part of American history.